Somewhere Roman Gabriel, Jack Snow, Deacon Jones and Merlin Olsen are wishing they could have played for the 2018 Los Angeles Rams. 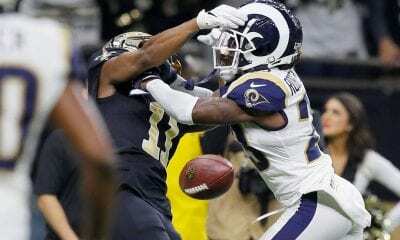 This one is for you guys as we honor again Tiebreaker.com’s top NFC team in our power rankings. We know about the power of the Rams’ offense, affirmed again during their 39-10 win over the San Francisco 49ers. Todd Gurley scored three touchdowns and is to Jared Goff what Marshall Faulk was to Kurt Warner and Emmitt Smith to Troy Aikman. But the most impressive thing about last week was watching Aaron Donald earn his $135 million with four sacks. The Rams are now 8-to-5 odds to win the Super Bowl. 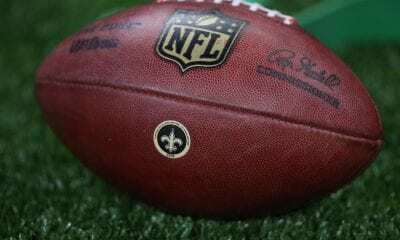 Led by Drew Brees, who now has 501 career TD passes, the Saints literally passed their test against the NFL’s stingiest defense, the Baltimore Ravens. Of course, it took the an unprecedented miscue, the first missed extra point in Justin Tucker’s career, to prevent overtime. A win is a win. We can’t wait to watch the Saints, who have won five straight, trade TDs with the Minnesota Vikings this week. By the way, Brees hasn’t been intercepted since last season’s loss to the Vikings in the NFC Divisional Round. After watching Case Keenum turn Adam Thielen into one of NFL’s top receivers, it should surprise no one that Kirk Cousins has helped him develop into perhaps its best wide threat. Thielen (67 catches) is the first receiver in the Super Bowl era to have at least 100 yards receiving in the first seven games of a season. Do you remember Charlie Hennigan? He did the same thing for the 1961 Houston Oilers. The win over the Dallas Cowboys was very impressive. It convinced us the Redskins are a serious contender in the NFC East, not to mention its only team over .500 (4-2). Washington doesn’t do anything spectacularly well, aside from stopping the run. The defense created two fumbles on Sunday and has forced at least one turnover in 10 straight weeks. This seems to be a very steady bunch. Credit is due to the Panthers for the way they fought back from a 17-0 deficit on the road to beat the Philadelphia Eagles. It was the largest fourth-quarter comeback in franchise history. To do it, they rode the momentum Cam Newton built by working out of a no-huddle set and throwing for 226 yards in the final 15 minutes. It’s clear the Eagles (3-4) are not the same team they were last year. It’s very difficult to repeat as Super Bowl champion. The Patriots were the last to do it in 2005. The way they blew the big lead against the Panthers would have been enough for their fans to start throwing snowballs at Santa Claus again, if there was snow to pack. 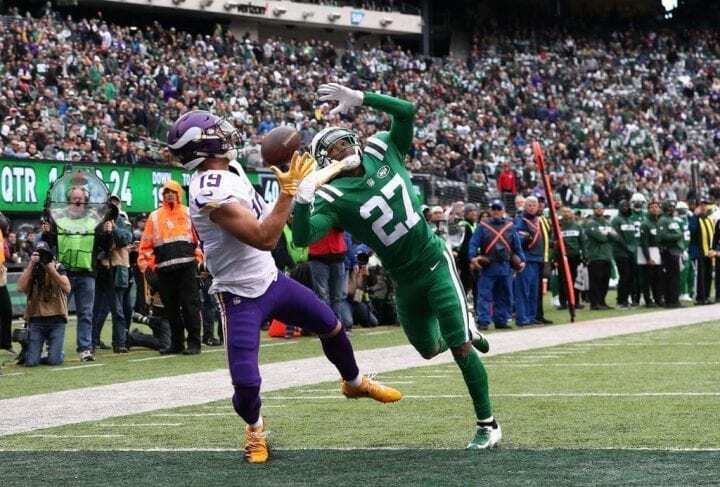 Perhaps redemption will come Sunday in London against the slumping Jacksonville Jaguars. We weren’t expecting the Bears to beat the Patriots last week. They aren’t quite ready to make a leap that dramatic yet. But we were expecting a little more from their defense. It’s hard to imagine a QB that’s improved as much than Mitchell Trubisky, which means the Bears won’t go into hibernation come December. He almost pulled it out against the Pats with his great last-gasp Hail Mary to Kevin White. Just look at how horrible the Oakland Raiders are playing in Jon Gruden’s first season as coach. Now compare that to the transformation the Lions have made under rookie coach Matt Patricia since their debacle in Week 1 against the Jets. Not many of Bill Belichick’s lieutenants have become great head coaches. But it the Lions remained tuned in, things could get a lot brighter for this long moribund organization. And aside from the Saquon Barkley, who is a better young back than Kerryon Johnson, who ripped the Miami Dolphins for 158 yards on Sunday? There is not another team as solely dependent on one player as the Packers are in Aaron Rodgers. Imagine where this team would be if Rodgers hadn’t buckled up his knee brace and decided to grin through the pain. It doesn’t get any easier with the Rams next on the schedule. It’s been reported that the NFL is trying to talk Amazon’s gazillionaire Jeff Bezos into becoming the new owner of the Seahawks after the death of Paul Allen. Amazon already backs the league with advertising dollars and Bezos is based in Seattle. If this happens, there will be no shipping charges on any of Russell Wilson’s completions to Tyler Lockett. If its defense had played up to standard earlier this season we might be talking about Matt Ryan as a potential MVP. He threw for 379 yards against the New York Giants on Monday, has averaged 333.6 passing yards and is completing 71.1 percent of his passes. By the way, the Falcons have the best Italian placekicker in the world in Giorgio Tavecchio, who banged one home from 56. Well, now that the Cowboys have Amari Cooper – thanks to Oakland’s estate sale – they won’t be able to use the lack of quality receivers as an excuse for the way they have played. They are ranked 28th in passing offense. Cooper caught 155 balls for 2,223 yards and 11 TDs with the Raiders, But he had just 22 receptions and one TD this season. If this doesn’t help, what will Jerry Jones do next? There are usually a few teams every season that start off fast but end up face-planting for various reasons. Tampa most certainly is the NFC’s representative. Its maligned defense, a big reason for the collapse, took another major hit in last week’s overtime win over the Cleveland Browns when linebacker Kwon Alexander suffered a season-ending knee injury. Six of Tampa’s last 10 games are against teams with winning records. Only in New York would Eli Manning still be blamed for Monday’s loss in Atlanta after throwing for 399 yards. Only in New York would Odell Beckham, Jr. be overshadowed after reaching 5,000 receiving yards faster than anyone in league history. Then again, only in New York would an organization pay $62 million ($36 guaranteed) to on offensive tackle, Nate Solder, who Belichick obviously knew was a swinging gate. Watching them get dismantled by the Rams was difficult. So much was expected from the 49ers this season and then injuries, especially to QB Jimmy Garappolo, punched the team in the gut. We are content to hold judgment until San Francisco gets the chance to play at full strength. Awful. Embarrassing. 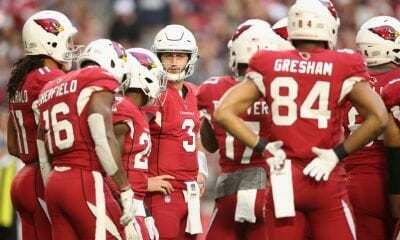 A lack of offensive ingenuity, despite the presence of a future Hall of Fame receiver, Larry Fitzgerald, has killed this franchise. Ryan Leftwich is the new offensive coordinator and no one in the league has a more difficult job than he. Things are so bad All-Pro corner Patrick Peterson has asked to be traded.